I originally was planning on waiting until all the books in this series were out before I started reading them all. I knew right away after reading Throne of Glass (review here) that I would LOVE this series and would want to be able to read them all in a row, right away. However I lost patience and decided to just go for it! And boy was I glad that I did! 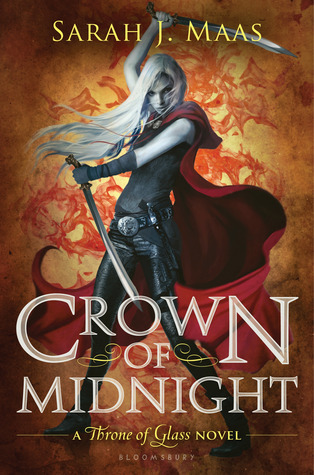 Throne of Glass was a fabulous book and Crown of Midnight was even better! All the characters were introduced to us already and the world was set up so in Crown of Midnight we really got to see more of the characters and their lives (compared to Throne of Glass). One of my favourite things about this series is the characters; sweet, strong Nehemia, willful, girly Celaena, handsome and kind Chaol and intelligent, conflicted Dorian. All of them bring so much to the story and I just absolutely loved getting to know them more, and see more of their personalities. The best thing for me was seeing Celaena get to live a more normal life, running for fun with Chaol, eating breakfast in bed with Nehemia- I LOVED it all. I could read a whole series on these characters just living their everyday lives without drama. This book was in two parts and Part One was a favourite of mine because of all the character development and storylines with them. I definitely love Celaena and Chaol and was so happy that they got to spend time together and getting to see them living more normally was amazing. However, this book really brought the drama! Oh man. That's all I can say without spoiling things but it was crazy good. Part Two really was the start of the crazy, crazy drama. Sarah J. Maas has an amazing ability to spin together characters and intricate story lines, full of details and little connections. There were so many twist and turns in this book, that I definitely did not see coming which I enjoyed. Predictable books can be a bit boring. Crown of Midnight was anything but boring. I had to force myself to put down the book at night because I knew I had class early the next morning. After Throne of Glass I wasn't sure if things could get any better, but I was definitely wrong, Sarah J. Maas has definitely elevated the world of high fantasy to new levels! I would DEFINITELY recommend this series to everyone! Especially is you love high fantasy, princesses and royal kingdom stories, realistic warrior women and amazing characters and plots!